After a 5 year hiatus, California's Slave Unit returns with a new attitude and new album, Through With You. Conceived in 1995 as a solo project of Mike Welch, Slave Unit is one of the innovators of the "Coldwave Sound" that took the world by storm in the early/mid 90s and has continued to progress into the 2000s. 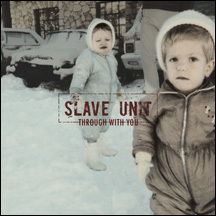 Slave Unit's sound strikes you with powerful rhythms, bass-heavy beats, original samples and crunching guitars. Through with You follows Slave Unit's signature formula and stellar tracks like "Typical," "3," and "Euthanize" will not disappoint the coldwave loyalist. Other tracks like "I Don't Care Anymore" and "Lordfly" can crossover into the heavy metal and hard rock genres while "Typical" and "Rep.Resent" dabble in hip-hop. Overall, Through With You was well worth the wait and propels Slave Unit into a force to be reckoned with for the future.